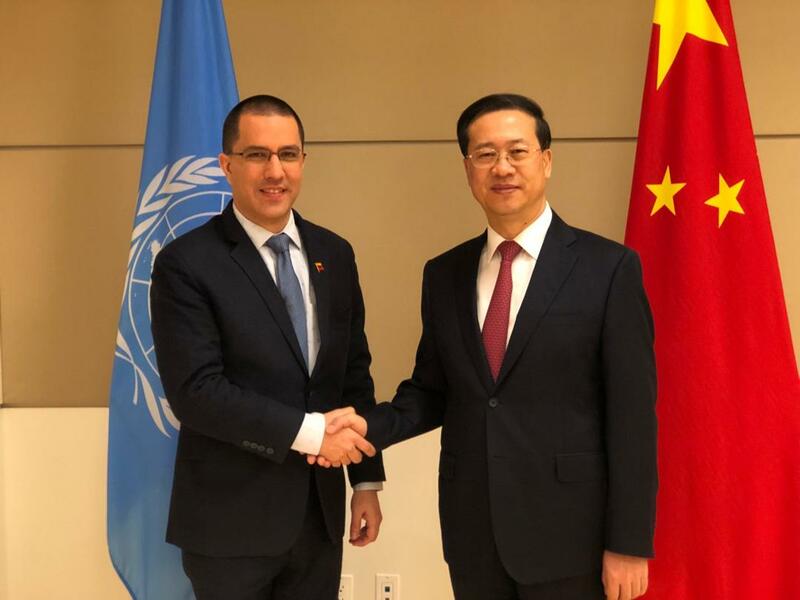 As part of the bilateral agenda taken by the foreign minister of the Bolivarian Republic of Venezuela, Jorge Arreaza, at the United Nations Organization, he held an important meeting on Thursday with the Ambassador of the People’s Republic of China to the UN, Ma Zhaoxu. The diplomatic meeting took place in the facilities of the multilateral organization, in New York, and it was favorable for the Chinese Ambassador to reiterate, on behalf of his government, his support with the people of Venezuela and President Nicolás Maduro. In this regard, both diplomatic authorities reviewed the bilateral agenda they are carrying out for the development of both peoples, as well as expressing their willingness to keep working on the strategic integration that exists between sister nations. Previously, FM Arreaza held a meeting with his Chinese counterpart, Wang Yi, during the 73rd Session of the General Assembly of the United Nations (UN) where they expressed that the relations between the two countries are at the most high level and with the vision of increasing the bilateral cooperation in various development areas.